Four-legged friends provide the most unconditional support and love that humans can experience. Why leave your closest companion—or, pseudo child, for some—at home while you visit the Roaring Fork Valley? 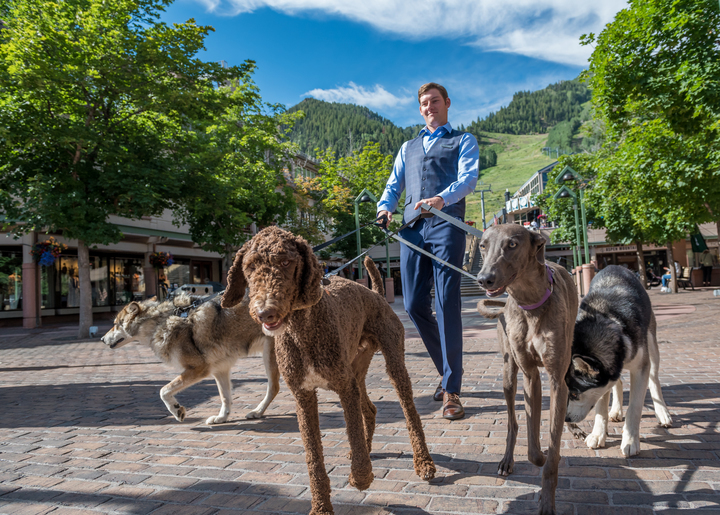 Families throughout the Valley and Aspen own their own pups, and the community is dog-friendly from public spaces to trails. Even accommodations feature services for canines so that your favorite furry pal can have a great vacation, too. Dogs simply are a part of the Valley community. Life would not be the same without them, and we welcome your Fido, too. Well-mannered dogs walk the streets, stroll into businesses, and are welcome to stay overnight at various hotels. The same inclusivity for furry pals extends to Aspen’s vast network of surrounding trails. Basalt-based travel writer, Laurel Miller, recommends Grizzly Lake, West Maroon Pass, River Run, Cathedral Lake, and Hunter Creek, which all vary in distance, difficulty, and accessibility. Various hikes that leave from iconic Maroon Lake trailhead—Maroon Lake, Crater Lake, and Buckskin Pass—in the White River National Forest also welcome leashed dogs. And, the Aspen Snowmass Nordic Trail System has six dog-friendly trails. There is no shortage of adventure options for your trail time! When you decide on your accommodations, also speak with a concierge and find out their suggestions on hikes that will compliment your schedule. Need a new toy, puppy supplements, or poop baggies? Need to book a dog training session (while you’re at your ski lesson or guided day of fly fishing on the river)? Don’t hesitate to stop by CB Paws, Only Natural Pet, or the Rocky Mountain Pet Shop, all located in downtown Aspen. The Little Nell is a pet-friendly hotel in Aspen, and we welcome doggies with a pamper-heavy menu. 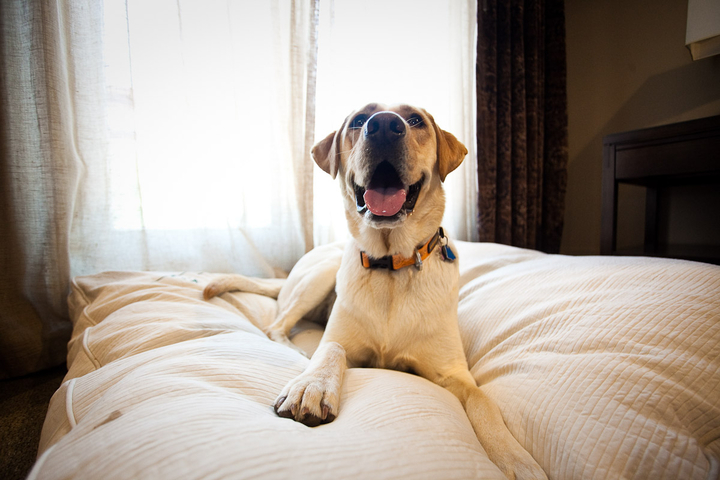 Upon arrival, your room will have dog-friendly water and food bowls, a dog bed, and even a Puppy Jet Lag Kit to help your pup adjust to the altitude. To replenish your dog’s excitement is what could be the best menu your dog has ever smelled. In addition to epicurean treats, the meals each feature carrots, brown rice and scrambled eggs, and a choice of the following protein: local ground beef, grilled chicken breast, or grilled salmon. The Little Nell also offers dog walks, dog sitting, and can help you plan your outings to pet-friendly trails. To top off the special treatment, each dog also receives a personalized brass identification tag, and pet owners are welcome to a Petiquette, a helpful handbook of guidelines for pet etiquette. Limelight Hotels, in Aspen and Snowmass (opening winter 2018/19), are both pet friendly, as well. Your pup’s stay includes complimentary bowls and placemats. Your dog is a member of the family; pamper them in Aspen with hikes, treats, and lots of smooches.